A pro-Russian actress was included in five different Ukrainian reports. She even wore the same hat in two of the reports! 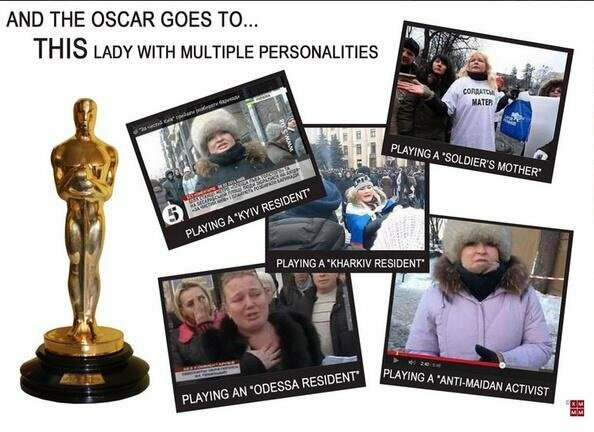 The “actress” has played roles in news clips in Kiev, Kharkiv, Odessa. She has played as a soldier’s mother and an anti-Maiden (pro-Russian) activist. In another propaganda piece – Russian news claimed a violent protest occurred in Crimea when the photo was taken days before in Kiev. UPDATE: The Daily Mail has more on the pro-Russian actress.